Q. Are your cutting boards made in Canada? A. All of our cutting boards are made right here in Canada, using the highest quality hardwoods. Read more about Cutting boards made in Canada. Q. What wood species do you offer? Q. Is the wood you are using in your cutting boards Canadian? A. Yes, each board is crafted from hardwoods grown in Canada. Q. Can I put my cutting board in the dishwasher? A. Wood products should never be put in the dishwasher. It causes them to unglue and to deteriorate. Use warm water with a mild detergent, rinse in clean water and air dry—that’s all you need to keep your boards in good shape for years. Read more about cutting boards in the dishwasher. Q. Is the glue used safe? A. All the glue used in our cutting boards is food grade and totally safe. Q. Can I put a wood cutting board in the oven? A. No, you can’t put the cutting board in the oven. The glue will dry, and the hardwood will dry and split. Q. How do I clean my cutting board? A. Rinse your board right after you use it. At that point or later use a cleaner with anti-bacterial properties for a deeper clean. Q. How do I get rid of stains? A. Both baking soda and coarse salt work well. Start with a dry cutting board and sprinkle it well with the baking soda or the salt. Use a wet brush or a sponge to scrub out the stain. You may need to repeat the process more than once to get out deep stains. Q. My cutting board smells. What can I do? A. White vinegar works well. Put vinegar in a spray bottle and spritz your board when you notice odors. Vinegar not only neutralizes bad smells, it also helps to disinfect the board naturally. Q. Do I need to oil my cutting board? 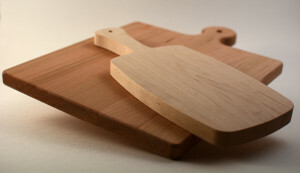 A. Oiling your cutting board periodically, depending on its use, will add to its attractiveness and durability. Every cutting board will last for years, but using mineral oil on it helps to protect it and extend its life. Q. How do I oil my cutting board? A. Choose a food-grade oil like mineral oil, a combination of beeswax and mineral oil, or one of the commercial cutting board oils and creams that are sold in kitchen supply stores. Thoroughly clean your cutting board before you apply the oil, then air dry it. Apply the mineral oil with a paper towel or soft, clean cloth. Put an even coat on all surfaces. Let the wood absorb the mineral oil for several hours. Then wipe it down with another clean cloth or paper towel. Many people find it convenient to put the oil on the board in the evening, then wipe it off in the morning. Q. What else can I use my cutting board beside cutting meat and produce in the kitchen? A. Our cutting boards make excellent serving boards for cheese, bread and cold cuts. They are perfect as hot serving plates. Q. What is the difference between a cutting board and a butcher block? Q. Does it have other uses? A. Hobbyists and crafts people use cutting boards for slicing, sorting and assembling. They are also helpful in the workroom for the do-it- yourselfer and the handyman, useful for splicing, sorting and cutting. Q. Can I get a board with a custom design? A. Yes, our team of designers will work with you to create a customized cutting board that fits your individual needs. Q. Can you laser engrave my boards for a special occasion or with my company logo and name? A. Yes, we offer professional laser engraving for all of the boards we sell. Q. What do you need from me so I can have my boards laser engraved? A. Send us a JPG or PDF file.